The radio announcer had it correct. 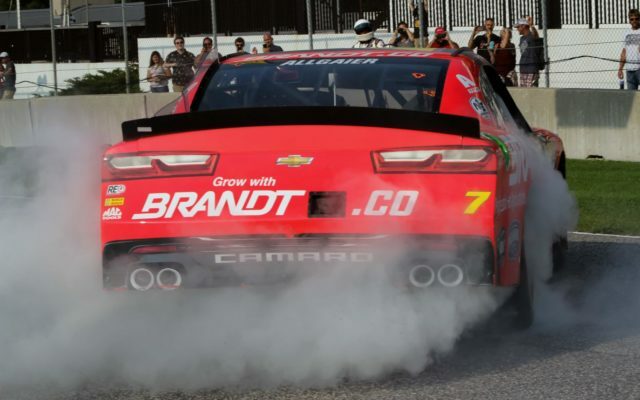 Once the smoke cleared and the challengers had fallen back, the Springfield, Illinois driver, who has now won three career road course races, was gone. 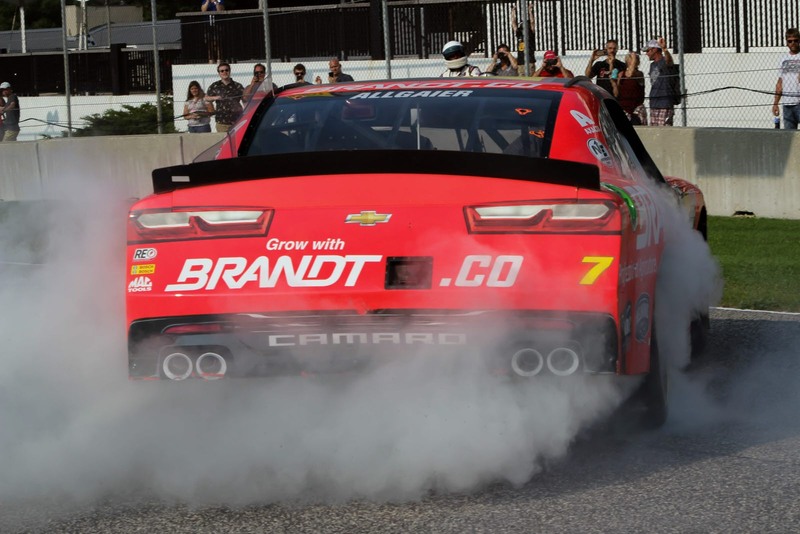 In a race that saw more bumping and grinding than had been seen at Road America in a long time, Justin Allgaier won the NASCAR Xfinity Series Johnsonville 180 Saturday, but he did it with a smart stroke of pit strategy rather than pushing anyone into the gravel traps. 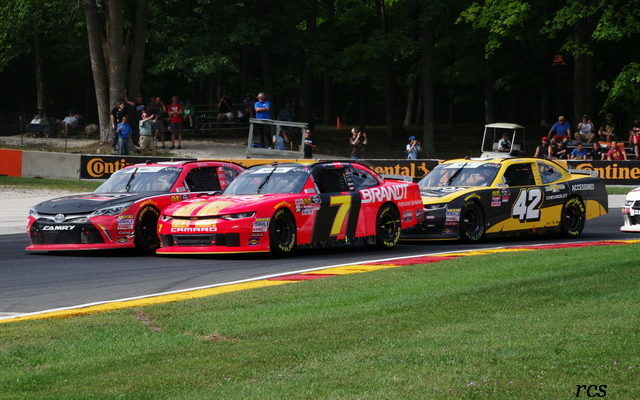 At that point the chase was on to catch now-leaderAllgaier’s JR Motorsports Chevy. 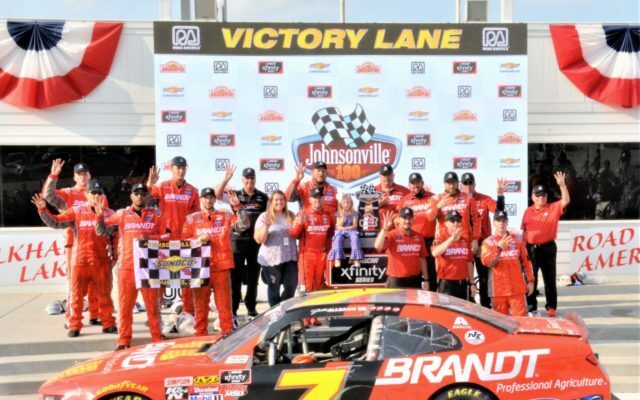 A chase that proved a problem to many as one after another Christopher Bell, James Davison, Brendan Gaughan, Justin Marks and numerous others tried, but failed to get to the orange Number 7. 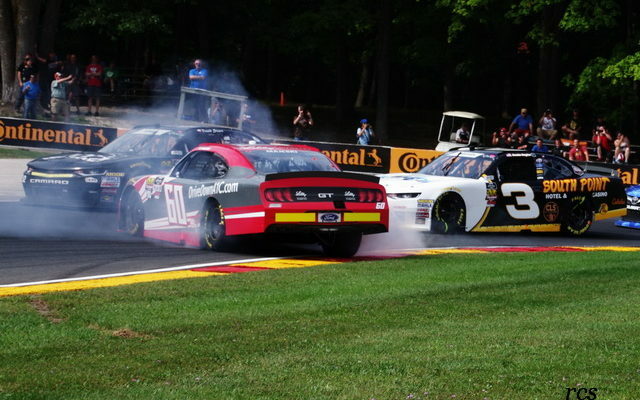 Davison and Marks even took each other out with Allgaier within reach. 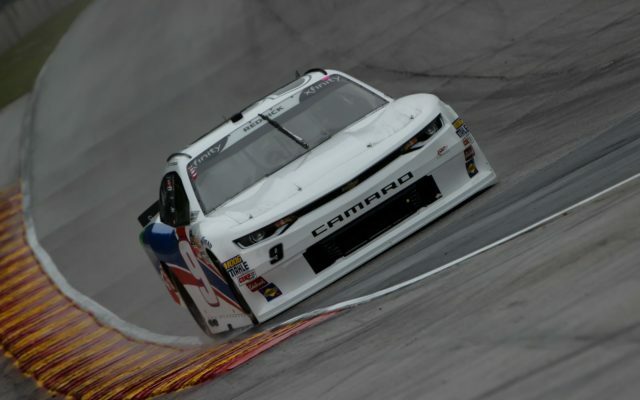 Pole winner Matt Tifft’s Chevrolet stayed in the top ten most of the day and finished second though he admitted that a handling problem slowed his progress. 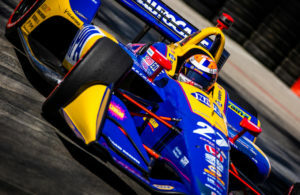 He was taken to the Care Center after the race due to feeling ill, but was later released. 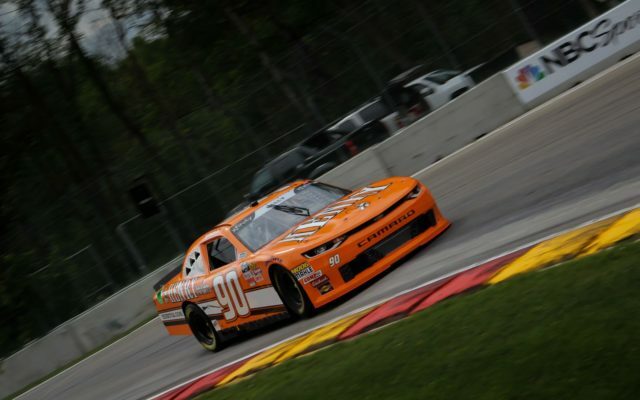 Winner of Stage 2, Daniel Hemric was third after tangling briefly with his car owner Brendan Gaughan who got off course at least twice in the final stage and finished 24th. 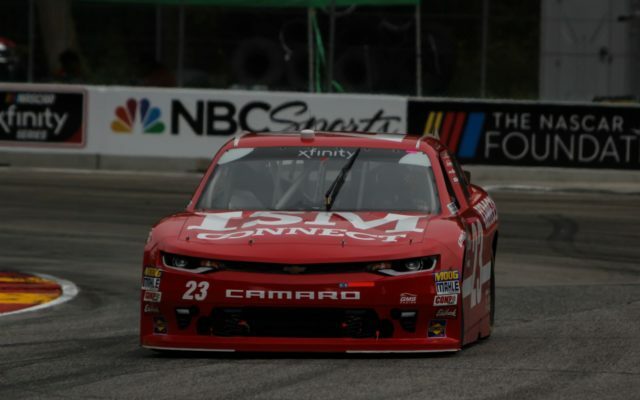 Cole Custer’s HAAS Automation Ford was fourth while the soon to retire Elliott Sadler was fifth. 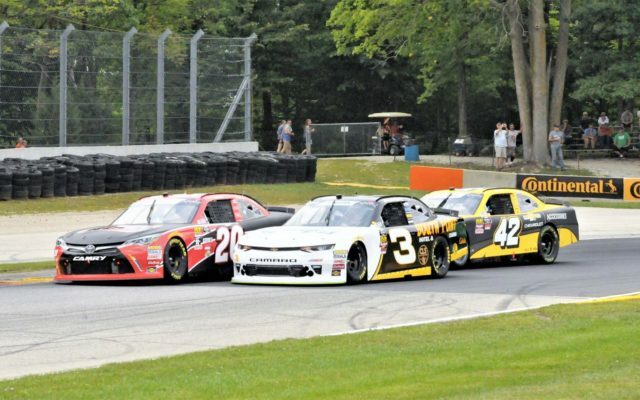 Note: Among drivers who don’t usually race in the series: Conor Daly (31st), Katherine Legge (14th) after running as high as third before spinning, Bill Elliott (20th), Ty Majeski (28th) and sports car expert Andy Lally (10th). 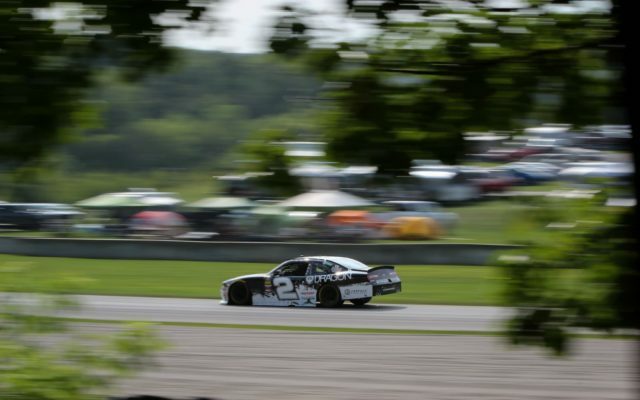 Wisconsin native Ty Majeski drove his Newman Wachs Ford Mustang to a last-minute win Sunday morning in Round 8 of the TA2 Powered by AEM Trans Am series race at Road America. 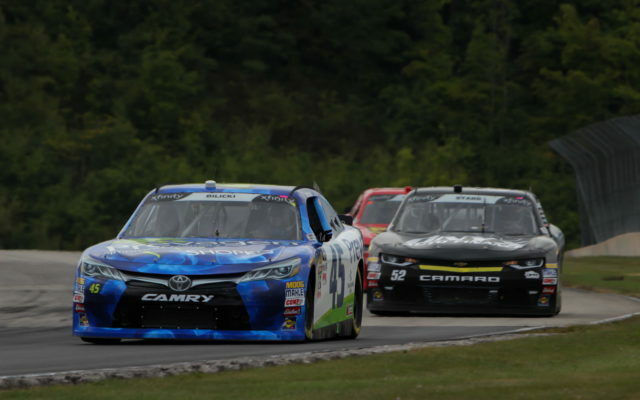 Majeski, a series rookie, who drives for Roush Fenway Racing in the NASCAR XFINITY Series, used a daring last lap pass of leader Matt Tifft in Turn 1 on a restart to secure the win. 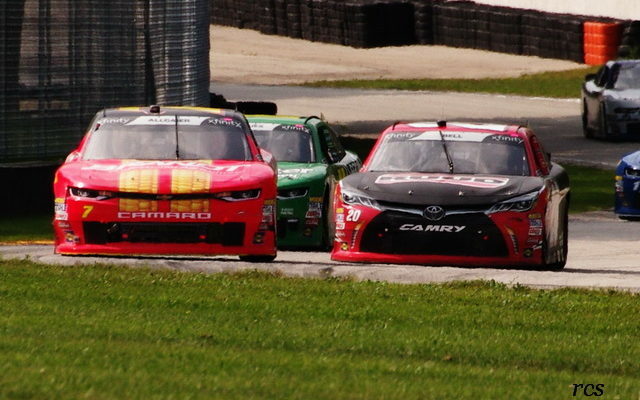 “I think he should have driven in just a little bit deeper,” noted Tifft with tongue firmly planted in cheek. “But, it was circumstances,” explained the winner. “I tried to time it and I didn’t know when the green was coming out. 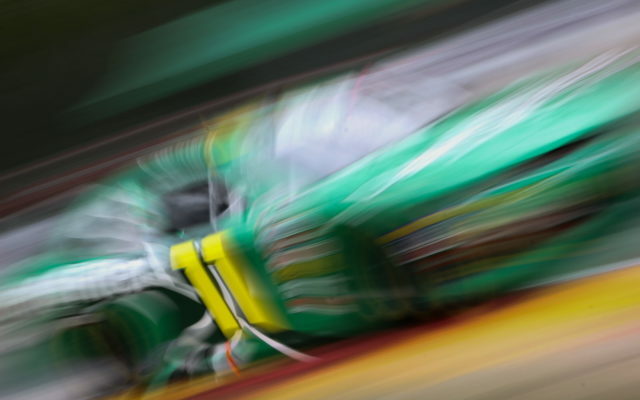 My crew said ‘Green flag is out’ so I went. 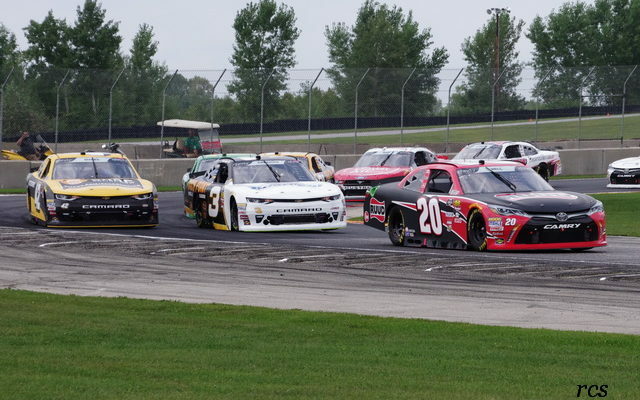 I got a good run off two and going into three Turn 2 and cleared him going into three” winning by a half-second. 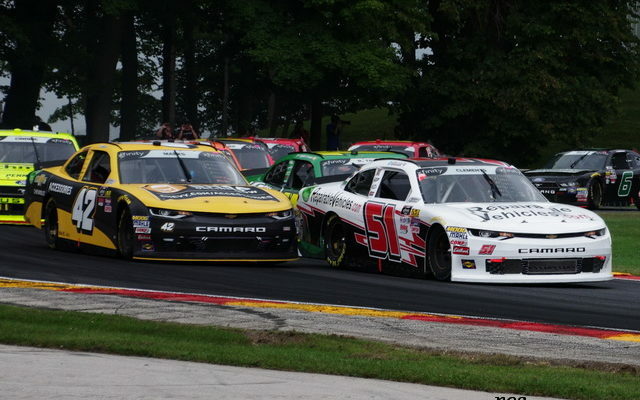 The win was the first for Majeski in the Trans Am Series and gave him valuable track time on the unfamiliar road course as he prepared for the XFINITY Series run later in the day. 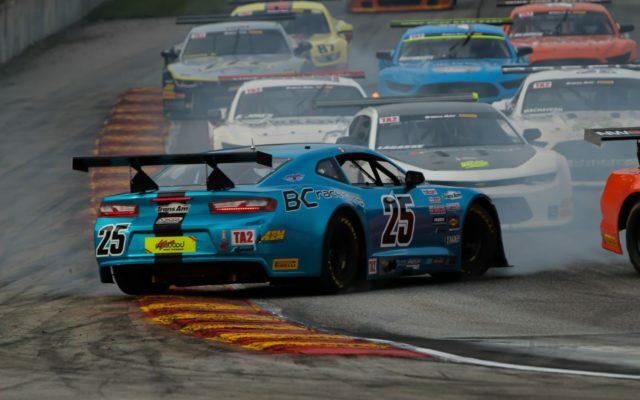 Earlier in the morning, veteran road racer Boris Said’s Dodge Challenger edged Chris Dyson’s Ford Mustang by less than a second to win the TA TA3 TA4 Trans Am Series event. 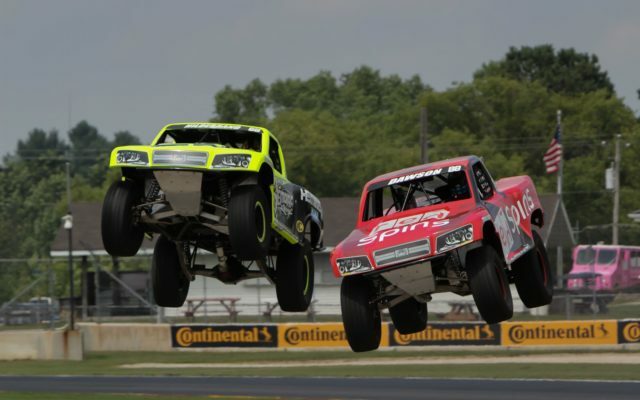 Paul Gohde heard the sound of race cars early in his life. Growing up in suburban Milwaukee, just north of Wisconsin State Fair Park in the 1950’s, Paul had no idea what “that noise” was all about that he heard several times a year. 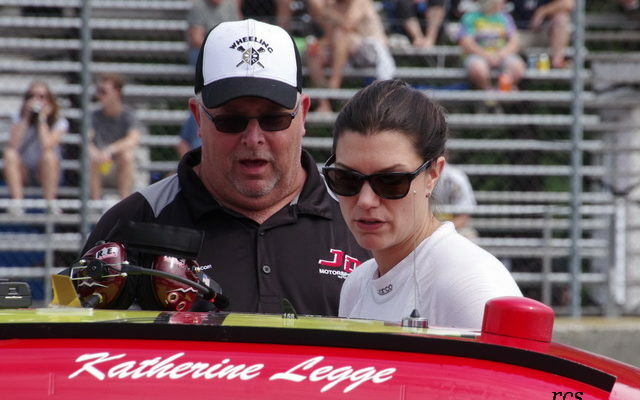 Finally, through prodding by friends of his parents, he was taken to several Thursday night modified stock car races on the old quarter-mile dirt track that was in the infield of the one-mile oval -and he was hooked. 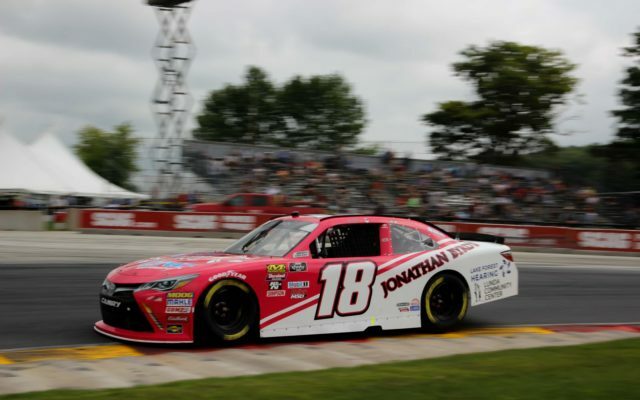 The first Milwaukee Mile event that he attended was the 1959 Rex Mays Classic won by Johnny Thomson in the pink Racing Associates lay-down Offy built by the legendary Lujie Lesovsky. 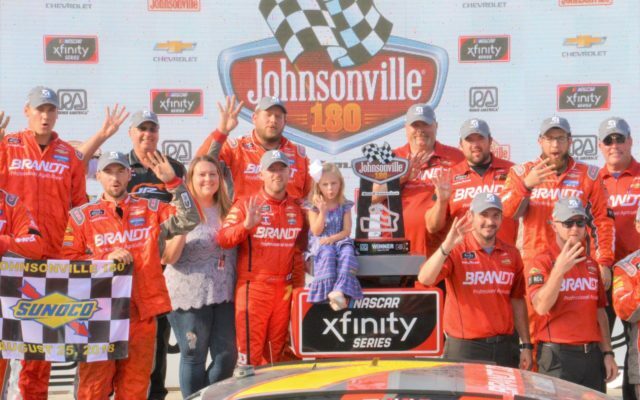 After the 100-miler Gohde got the winner’s autograph in the pits, something he couldn’t do when he saw Hank Aaron hit a home run at County Stadium, and, again, he was hooked. 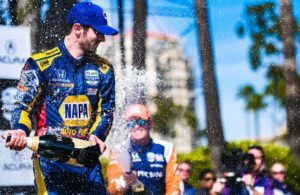 Paul began attending the Indianapolis 500 in 1961, and saw A. J. Foyt’s first Indy win. He began covering races in 1965 for Racing Wheels newspaper in Vancouver, WA as a reporter/photographer and his first credentialed race was Jim Clark’s historic Indy win.Paul has also done reporting, columns and photography for Midwest Racing News since the mid-sixties, with the 1967 Hoosier 100 being his first big race to report for them. 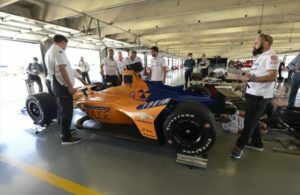 He is a retired middle-grade teacher, an avid collector of vintage racing memorabilia, and a tour guide at Miller Park. Paul loves to explore abandoned race tracks both here and in Europe, with the Brooklands track in Weybridge England being his favorite. Married to Paula, they have three adult children and two cats.